This is the sixth in a series of articles that attempts to disclose some of the known issues playing behind the scenes in the Calico Complex and beyond…. The beginning of this series originally presented a forward stating, “To understand the magnitude of what has occurred here – as well as to grasp where it is going and why – first, we must travel back in time to witness what BLM did, how they got away with it and how they plan to continue harvesting the bitter crops they began cultivating over two decades ago”. The Calico Complex is just a piece of a larger plan for the area by BLM and US Fish & Wildlife Service (USFWS) currently being hailed as the Tri-State Mega Complex as reported on April 6, 2010, by Carrol Abel of the LA Equine Policy Examiner. Here, officials reported the “conceptual stages of creating a two million acre management complex for wild horses in Southeast Oregon, Northeast California, Northwest Nevada and the Sheldon National Wildlife Refuge also in Northeast Nevada”, is now on the table. The Beaty Butte HMA is located at the southern tip of Oregon and is in the vicinity of the Sheldon National Wildlife Refuge. The National Program Office reports both the Herd Area (HA) and Herd Management Area (HMA) is identical at 399,185 public acres and 38,837 “other” acres totaling 438,022 acres. The wild horse AML has been set at a high of 250 horses or another way of saying it is, wild horse populations cannot exceed more than one horse per 1,752 acres. This AML was established in 1983 in the High Desert Management Framework Plan and has obviously been rubber-stamped every since…. Also, when I say “high AML”, I am referring to a policy change by BLM made about ten years ago when they decided to start using a “range” of AML that contains both a low and a high end. This range is based on the theory that if BLM maintained a 4-5 year removal schedule, the “low” would allow wild horses to grow during that 4-5 year time frame before they exceeded the “high”. Based on this criteria, the AML range is suppose to follow a percentage method that usually cuts the “high” AML down by 60% to allow for normal growth between scheduled removals before the “high” is exceeded. In the case of the Beaty Butte HMA, BLM has set it the AML range at a 100-250 horses, which should allow for a five-year span between each round up. However, according to BLM in the 2009 Beaty Butte EA, these wild horses double in population every three years, not five, indicating a 33% reproduction rate. BLM also stated that, “pronghorn antelope, mule deer and California bighorn sheep use the HMA for summering and wintering ranges”. In September 2009, BLM conducted a round up of the Beaty Butte wild horses. In the Post-Gather Report, BLM reported a pre-removal population estimate of 485 wild horses of which they gathered 423, removed 379 - including four reported deaths - and treated 30 mares with PZP who were returned to the range with an estimated 102 wild horses remaining. In September 2009, when BLM signed off on the environmental assessment to remove wild horses from the Beaty Butte HMA (and Paisley Desert HMA), they also slid in a ten-year plan authorizing “adjusting the ratio of males to females to approximately 60/40 and returning geldings to the HMA as part of the male component, in combination with treatment of all breeding age mares released back to the range with PZP to further slow population growth”. I also have to comment on an anomaly with respect to BLM’s Final Decision on that EA as something very unusual happened I had never seen before. Specifically, BLM signed the decision and then rescinded it and wrote a new one. Why? Well, as near as I can figure, the first decision authorized the castration of stallions immediately while the second decision put it off for “future” management. It also appeared that there were some legal issues BLM was attempting to circumvent in order to establish a new precedent for returning castrated stallions to the range. Also, that first decision that was later rescinded was not only sent to the “usual” stakeholders (meaning the public, various organizations and agency’s), it was also sent to the Interior Board of Land Appeals and BLM’s lawyers, who apparently bounced it back with a few “changes” to push it on through…. The South Steens HMA is also located in Oregon north of the Beatys Butte HMA and the South Steens wild horses are held in high regard by those who know them. “South Steens, like Calico, is one of those really special herds that ought to be national treasures”, states Nancy Kerson of Mustangs 4 Us. The original Herd Area BLM reported in 2004 for the South Steens HMA totaled over 280k acres while the HMA BLM determined could still be “managed” for wild horses totaled over 163k acres. By 2009, BLM reports the South Steens wild horses are only managed on 134k acres – a loss of over 146k acres of supposedly protected habitat. 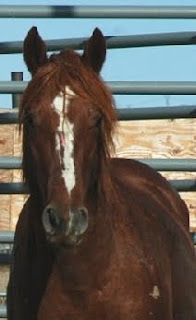 The BLM removed the South Steens horses in November 2004 and conducted yet another round up in late November of 2009. In 2009, BLM reported 482 wild horses were gathered, 369 removed and 59 mares were treated with PZP fertility control. BLM also reported that approximately 135 wild horses still remained on the range after the removals; all totaled, this equates to 504 wild horses. 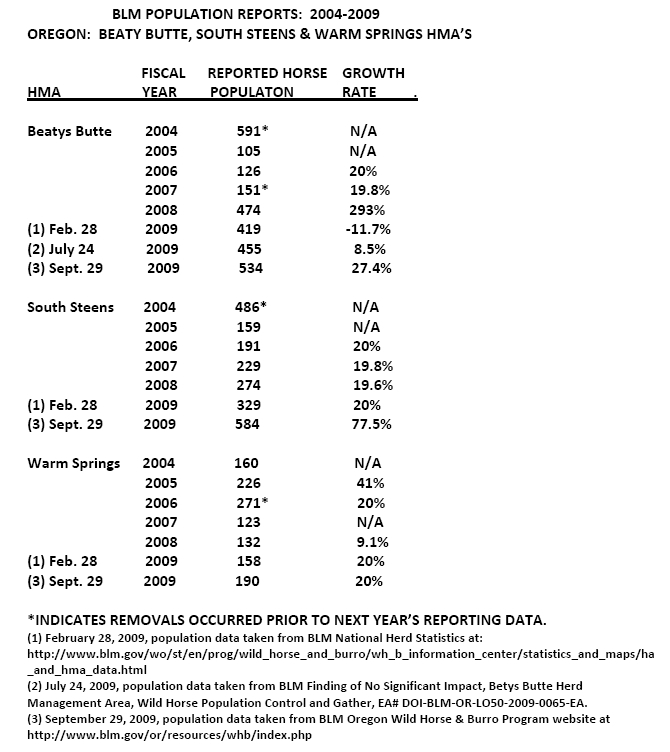 However, in February 2009, prior to the gather, BLM only reported 329 horses in the South Steens HMA. After the spring foaling season, the population should have only increased by 66 foals to total 395 horses. Yet BLM reported they found over one hundred more horses on the range than they should have during the 2009 November removal operations. Even more disturbing is, the BLMs Oregon WH&B Website reported the South Steens population was censused in July as totaling 584, not 504. Based on this, approximately 80 censused horses remain unaccounted for that were either left on the range and BLM failed to report them or BLMs census methods overcounted them, they “disappeared” somewhere during the round up process or perhaps they migrated somewhere else between July and November. So what are the implications of a long-history of movement between all these areas? For one, it means that most likely, the chances of Beaty Buttes PZP’d mares isn’t going to be sufficient to slow population growth down to 10% or less if many bands of wild horses can mix with other, untreated herds – including those residing in Sheldon. Another thing that makes this statement of herds moving back and forth between other HMAs and Sheldon very interesting is, according to the 2007 EA released by U.S. Fish & Wildlife Service (USFWS) about the Sheldon wild horse reproduction rates, managers reported that, “The herd’s growth rate is very strong, averaging between 17-23% net increase per year”. 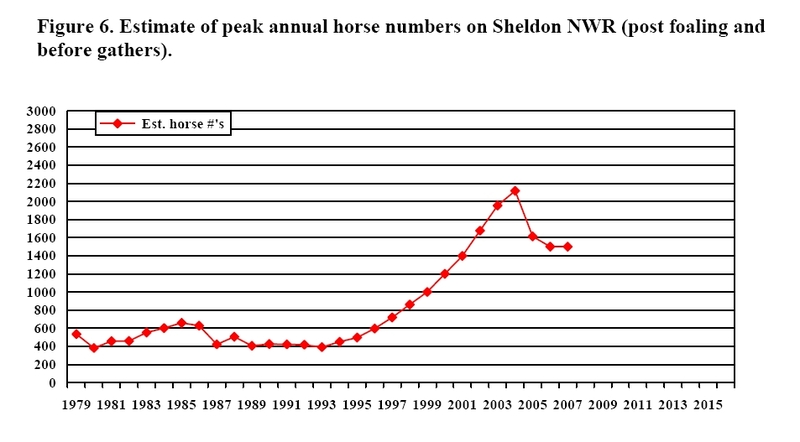 The 2007 Sheldon EA also provided a chart to illustrate the Sheldon herd’s growth over the years. 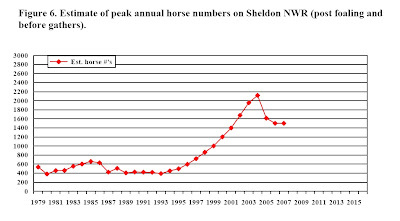 Also, according to managers, the Sheldon horses stopped being routinely removed around 1994, which in turn resulted in a progressive increase in their populations, until 2005, when the first new series of round ups began. Also, in examining BLMs National Herd Statistics for the Warm Springs, South Steens and Beatys Butte HMAs, generally, BLMs own data fails to support any significant movement between any of these areas either – but I did say generally, didn’t I? I created the following Table using BLM’s own National Herd Statistic data reported for 2004-2009 as well as data provided by the BLM Oregon Wild Horse & Burro webpages . I have added the reproductive % rates for each year based on BLMs reported populations to help determine any anomalies that might be due to horses moving back and forth between any of these areas. Based on this information, there are five potential reports that could support BLMs claim that there is a “long history of drift” between the herds. > In 2004, BLM conducted a round up in the Beatys Butte HMA and the Warm Springs HMA saw a 41% increase instead of 20%. This could indicate that approximately 34 horses moved over to the Warm Springs HMA because of the removal activities. > In 2008, the Warm Springs HMA population report indicated only a 9.1% increase versus the normal 20% while the Beatys Butte HMA reported a 293% increase. This could indicate a marginal amount of the Warm Springs horses – about 15 – moved into the Beatys Butte HMA. > Between 2007 and 2008, BLM reported a 293% increase in reported wild horse population for the Beatys Butte HMA, which jumped from 151 to 474. > Despite BLM reporting no wild horses were removed between 2008 and 2009, the Beatys Butte population declined from 474 animals in February 2008 to 419 animals in February 2009. If one adds a 20% reproduction rate for the 2008 spring foals (an increase of 95 additional foals), the actual wild horse decline was approximately 150 horses. > In February 2009, BLM reported the South Steens HMA population was estimated at 329. A 20% increase due to foaling season would add an additional 66 horses to equal 395 by July 1st. Yet, a July 2009 census reported 584 wild horses were found instead, an unexpected increase of approximately 189 horses. These numbers indicate it is possible that approximately 150-200 wild horses moved from Beatys Butte HMA to South Steens HMA. Is your head startng to hurt yet? I know mine is! While BLM’s National Program Office (NPO) was reporting the Beaty Butte wild horse population was merely 151 in February 2007, what you don’t see when you just look at just the NPO Herd Statistics between 2007 and 2008 is - BLM conducted a round up in late July, early August 2007, after they reported the 151 horses but before they reported 474 wild horses still remained in February 2008 – with no foaling season in between. According to BLM’s 2007 National Gather Schedule, BLM reported removing 260 wild horses between July 29 and August 11 from the Beatys Butte HMA. Seems impossible after reporting there were only 151 horses there (even adding a 20% increase for the spring foals would only add up to 180, not 260). Yet, the 2007 National Gather Schedule goes on to report that after removing 260 wild horses, BLM estimates another 300 are left. Yet, by the time it gets to the National Program Office “Herd Statistic Division” - somewhere between August 2007 and February 2008 - BLM now reports the wild horse population jumps again; instead of 300 being left, now BLM reports 474 wild horses are left in the Beaty Butte HMA after the 2007 summer round up. All totaled, it would appear that somewhere between February 2007 and February 2008, the wild horse population shot up from 151 wild horses to 734 wild horses instead, which is now a 388% increase. (474 remaining plus 260 removed in July/August). Yet none of the other HMAs BLM propose contain “drifting” population reports to show similar declines to account for these numbers. In fact, it's Beaty Butte that seems to be supplying the wild horses to other HMAs, not the other way around as by July 2009, BLM reports Beatys Butte loses approximately 150 horses while the South Steens HMA picks up 189 horses. Despite BLM removing 260 horses in 2007 and potentially 150-190 horses also moving across many miles to relocate in the South Steens HMA, BLM continues to report there were still 534 wild horses in the Beatys Butte HMA by September 2009! So where are all these horses coming from? 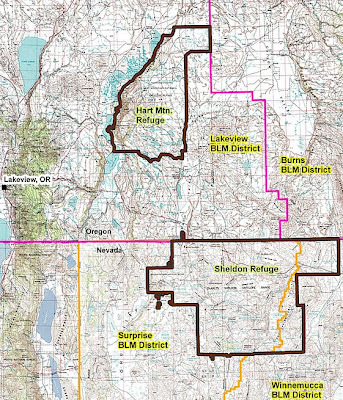 If these two areas are added together, they total 445 horses – the exact amount BLM states they intend to gather in the first paragraph of the Beatys Butte 2009 Finding of No Significant Impact Decision. However, according to BLMs publicly posted “Oregon BLM Wild Horse and Burro Population Data”, posted for September 29, 2009, BLM lists a census conducted on July 29, 2009, in the Beatys Butte as counting 534 horses - not 455 wild horses as listed in the FONSI, or the 485 wild horses estimated in the Post-Gather Report or even the 256 listed as officially residing in the Beatys Butte HMA. Instead, the Oregon population data posts an additional 79 more wild horses than any other BLM document, even though all of these documents were supposedly done in the same month by the same personnel! And based on the July census, we are now missing 79 horses from Beatys Butte and 80 horses from South Steens the September and November removals! It gets even more questionable as, the only way BLM could come up with these sort of numbers in both the census, the population reports and the post-gather reports is, they had to include the number of wild horses reported on the Hart Mountain portion of the Sheldon National Wildlife Refuge. So that means BLM had to be rounding up wild horses in Hart Mountain and adding them to the Beatys Butte numbers. One other note that may be of interest to those of us who are trying to sort out the truth from the lies in the BLMs management of the Wild Horse & Burro Program; because BLM removed wild horses from the Beaty Butte HMA in 2007, their removal numbers were also cross-referenced with the 2007 Capture Status Records obtained by American Horse Defense Fund via FOIA. According to the Capture Status Report, 272 horses were removed from the Beatys Butte HMA in 2007 – but 23 of them weren’t removed in August; 18 wild horses were reported as removed on March 29, 2007, 1 wild horse was reported as removed on May 30, 2007 and 4 more horses were reported as removed on June 8, 2007 - right in the middle of foaling season when BLM isn’t suppose to be conducting removals. Furthermore, no record of these removals is listed on BLM’s 2007 National Gather Schedule or in the 2009 Beaty Butte Wild Horse Capture EA. So where are all these horses coming from – or going too - if BLM continues to report that all the HMAs in the area are experiencing huge population explosions, not declines? Could the source of all the Beatys Butte wild horses be part of the mysterious disappearance of 700 Sheldon horses right after Refuge managers were threatened with a lawsuit about removing them in the summer of 2007? Is it possible the Sheldon horses were deliberately run into the Beaty Butte HMA and surrounding areas to account for all these “population explosions” now being found by BLM? 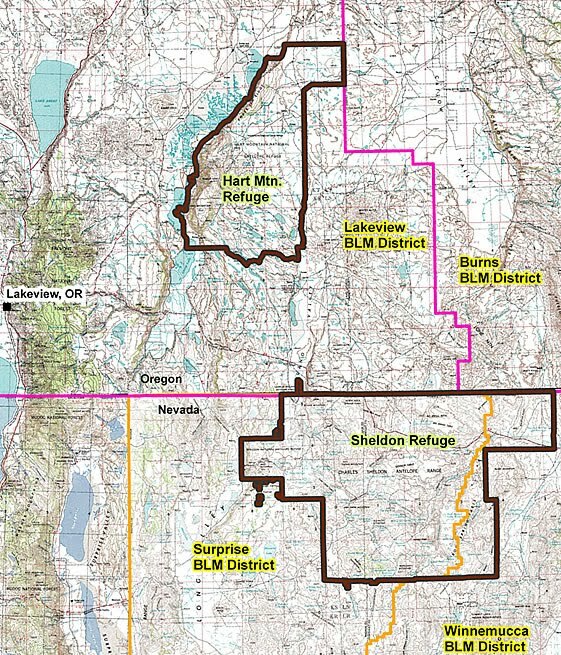 With respect to BLM reporting that, “189 wild horses, 157 adults and 39 foals, were counted on the Hart Mountain portion of Sheldon National Wildlife Refuge”, here we find another place now reporting unprecedented wild horse populations and presence; the Hart Mountain portion of the Sheldon-Hart National Wildlife Refuge. So why, after over thirty years, did almost two hundred horses show up at Hart Mountain? Other BLM managed HMAs with dramatic population increases between 2007 and 2008 that surround the Sheldon portion of the National Wildlife Refuge include; the High Rock HMA, which jumped from 124 to 356, the Calico Mountains HMA going from 264 to 549, the Warm Springs Canyon HMA skyrocketing from 139 to 607, Black Rock Range East swinging from 74 to 215, and Black Range West reported as catapulting from 76 to 399. However, despite reporting “a 80% increase in the adjoining HMAs” during a March 2008 aerial survey, BLM’s National Program Office only reported one HMA as having any significant increase - the High Rock HMA. The other adjacent HMAs of Bitner, Nut Mountain and Wall Canyon had all been “gathered” in September 2007 prior to the February 2008 reporting date and BLM failed to report any significant change in the populations for the “other” adjoining HMAs in either 2008 or 2009 National Herd Statistics reports. Because of BLM not reporting any increases in these HMAs, as well as Massacre Lakes HMA, only those HMAs with sudden reported population explosions will be analyzed further. In the spring of 2007, Sheldon managers reported there were approximately 1,500 wild horses living in the Sheldon National Wildlife Refuge. Then USFWS were threatened with a lawsuit in August 2007 and lo and behold, they reported in September 2007 that “a new census” conducted in June by Nevada Department of Wildlife counted only 800 horses were actually on the Refuge, not 1,500. Now if we add up all the population reports for those HMAs who had unexplained population explosions between February 2007 and February 2008 that are in the vicinity of Sheldon, which include the Beatys Butte, High Rock, Calico Mountains, and Black Rock Range East and West HMA’s, here’s what we find. In February 2007, the total wild horse population for all the HMA’s listed above was 828. Add a 20% reproduction rate to this (an increase of approximately 165 foals) and by July 2007, the population should be about 993. 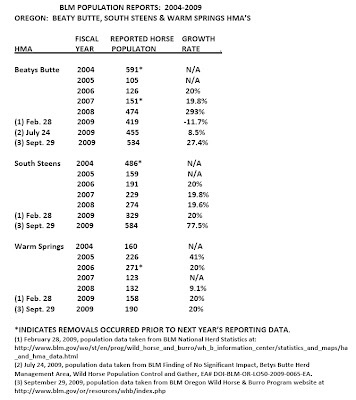 Yet, by February 2008, these same HMAs are now reporting a population of 2,600 horses (but this doesn’t include the 260 that BLM removed during the August 2007 Beatys Butte round up or the South Steens population explosion going from 329 to 584 between 2008 and 2009 or the 189 reported on Hart Mountain National Wildlife Refuge, as some of these population reports occurred after the 2007 reporting dates). So for the first time ever, according in both BLM’s and USFWS’s wild horse population reports as shown above, some of the HMAs surrounding Sheldon shot up by approximately 1,600 to 1,800 wild horses - right about the same amount Sheldon was trying to get rid of back in 2007. Meanwhile, Sheldon’s current manager, Paul Steblien, refuses to release any population reports on the number of wild horses USFWS has removed since 2008, the results of any aerial or ground surveys or what the current population on Sheldon is now estimated to be. For those discerning readers, here’s some additional food for thought…. According to BLM’s Team Conference Call Report, Sheldon managers began castrating stallions and returning them to the range in 2008. A year later, BLM approves of the same plan for an HMA that is very close to Sheldon and tries to get it rammed through immediately - but BLMs lawyers kicked it back with a few tweaks. So, if one were to entertain the outrageous idea that managers from different agency’s (who both answer to Secretary of the Interior) are conspiring to push wild horses around like livestock to avoid lawsuits, artificially increase populations to justify budgets, round ups and/or herding them from place to place for discrete “disposal”, wouldn’t it be easier to hide a castrated Sheldon horse on a BLM HMA if BLM approved of castrating a few stallions of their own?